The Sacred Hearts Academy LEO Club members have jumped back into business with three major events held in August. 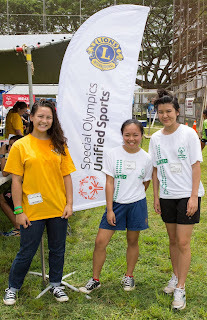 On Aug. 6th, the Sacred Hearts Academy Leos supported Special Olympics Hawaii’s Aukake Classic playing football with participants. Then on Aug. 13th, the girls were up early to assist at the Heart Walk at Kapiolani Park. Rounding off their jam-packed month was the The Kamehameha Lions, sponsors of the Academy's LEO Club, 10th Annual "Laughs for Lions" fundraiser which raises money for various service projects and scholarships on August 20th. At the event Academy LEOs had a chance to work alongside Miss Hawaii USA, Chelsea Hardin, the 501st Legion, and nationally acclaimed comedians: Dat Phan, Michelle Welch, Paul Ogata, Kurt Swann, Tony Calabrese, and Steve Byrne and the Soup Nazi from Seinfeld. The Leos were joined by LEO-to-Lion Academy graduates: Alyssa Kwan ‘15, Angela Hesch ’15, Kasandra Kitagawa ’14, Siman Zhang ’14, Joy Moriguchi ’12, and Mai Shiomi ’11.